Executive Mosaic is honored to introduce Joe Ayers, vice president & general manager, EG Public Sector – US at Hewlett Packard Enterprise, as an inductee into the 2017 edition of the Wash100 — Executive Mosaic’s annual selection of influential leaders in the government contracting arena. In his current role at HPE, Ayers collaborates with federal partners to deliver cloud, technology and related consulting services. In a July 2016 conversation with ExecutiveBiz, he discussed the creation of an estimated $26 billion global technology services company that will form out of a planned merger of HPE’s enterprise services segment into Computer Sciences Corp. and shared his views on the combined business’ federal market footprint. “With a split of the enterprise services business we will continue to support the entire systems integration community,” Ayers said. “There will be no change on where we go to market… the combination of CSC and HPE Enterprise Services will create a large IT service company that will be able to compete effectively in a very tough market,” he added. Ayers also cited areas that offer potential opportunities in the federal healthcare information technology market, such as big data analytics, storage growth, security and wireless. Also in 2016, World Wide Technology said it will collaborate with HPE to provide on-demand data storage support for the Defense Information Systems Agency‘s enterprise environments under the potential six-year, $427 million Enterprise Storage Services II contract. 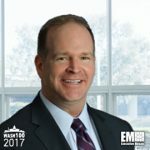 Ayers said then that the ESS II contract seeks to eliminate the use of monolithic architectures and help address the gap between the rising demand for data storage and reduced budgets. Prior to his role, he also served as VP of learning and development at HPE’s enterprise group. The former U.S. Army aviation officer spent more than 13 years at Dell as VP and general manager before he moved to HPE. Executive Mosaic congratulates Joe Ayers and the HPE team for their selection to receive this award.